Brooklyn Roasting drip and cold brew are on the menu, as well as a full bar of espresso drinks. The amped-up menu also includes new savory waffle options, such the 2nd Street Salmon Waffle with lox, lemon-dill sour cream, and pickled onions. Milkshakes are another new addition, including one made with the truck’s popular speculoos ice cream, which tastes like gingerbread cookies. DeGeest took great pains in the design, hoping to avoid a “run of the mill fro-yo type look,” and as you can see below, the place isn’t exactly, er, dingy (sorry: we weren’t going to go there, but we waffled). DeGeest hopes the airy, mulit-windowed interior will recall industrial kitchens from the 1960s. The walls are decorated with Belgian waffle irons from the early 1900s and zoomed-in photos of the New York-based cycling team that the company sponsors (according to DeGeest, “waffles and bikes are very closely connected in Belgium”). The biggest change from the truck to the café? 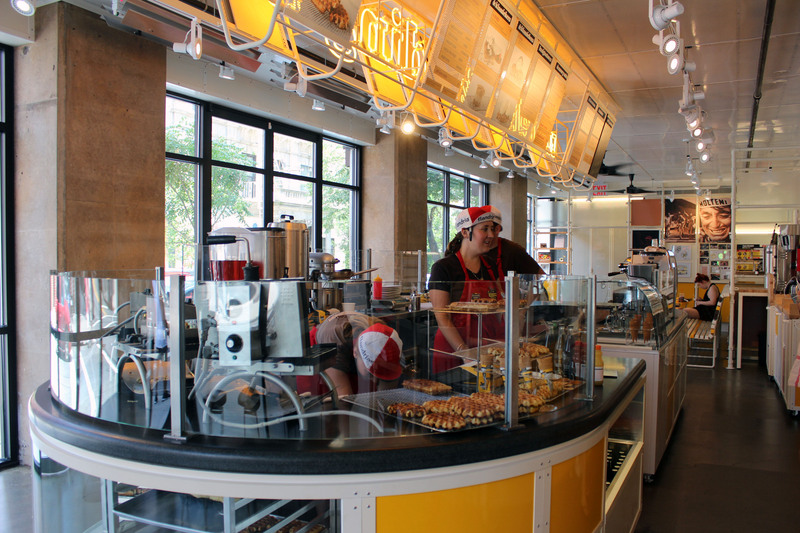 The store offers packaged versions of some of the goods (butter waffles, stroop waffles, and speculoos cookies) that the truck uses in its decadent concoctions, and is also selling a Belgium chocolate spread called Kwatta that can only be found at the café (DeGeest says he’s the only importer of the stuff in the United States). In from Chicago and already stopped by this week for my wafel fix. Had another new savory one: oh oh Serrano. Quite good. Need to come back often to collect them all. And w&d…you need to open in Chicago now that you’ve got the cafe concept opened. I’ll help spread the word!